You can use any character you like for the bullets in a bulleted list in; you’re not limited to the standard black circle. Word 2013 offers a choice of several common characters on a palette accessible via the Bullets button, and you can also select any picture or character from any font to use. Open a Word 2013 document which contains a bulleted list, select the bulleted paragraphs. From the Home tab, click the down arrow on the Bullets button, opening its palette, and then choose the check mark bullet. The list uses that character. Click the down arrow on the Bullets button again, reopening its palette, and choose Define New Bullet. The Define New Bullet dialog box opens. 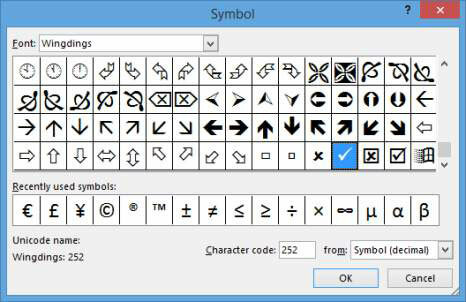 Click the Symbol button to open the Symbol dialog box. From the Font drop-down list, choose the font you like best, Wingdings for example. Click the symbol you like. In this case, the six-pointed black star (scroll if needed to find it), click OK to close the Symbol dialog box, and then click OK to close the Define New Bullet dialog box. The bulleted list appears with the new star bullets. Click the down arrow on the Bullets button again, reopening its palette, and then choose Define New Bullet. The Insert Pictures dialog box opens. 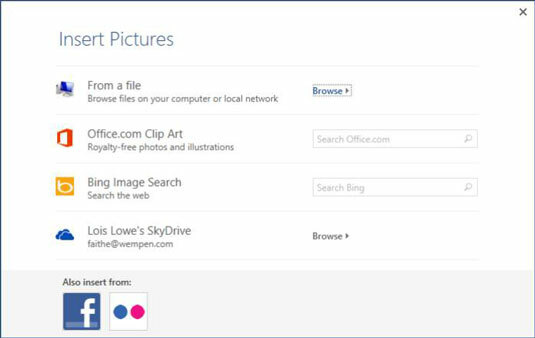 Click in the Office Clip Art text box and type bullet, and then press Enter. Click any of the picture bullets that appeal to you and then click Insert. Choose one of the simple graphics, not one of the photos of gun bullets. Click OK to close the Define New Bullet dialog box. The picture bullets appear in the document.